Every major golf club manufacturer is trying to beat the other one and that is usually accomplished by being the first at doing something. Whether it’s offering high end shafts as a stock feature, coloring the club head something, or offering 1,000 different adjustability options in a club; everyone wants to be the first to be that trend setter. Sometimes this works and sometimes not so much. Other times a company just sits back, bides their time, and does massive amounts of research to create a technologically simple club. 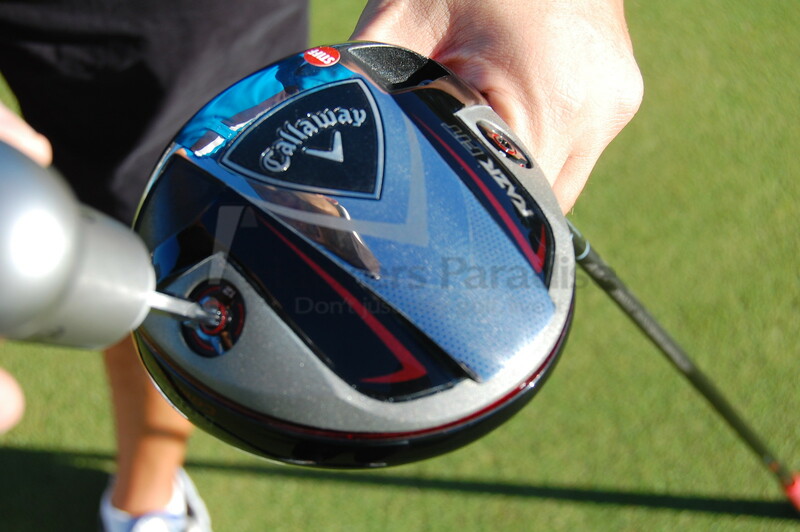 Enter the Callaway RAZR Fit driver. Callaway spent years developing this driver and unveiled it to the golf world earlier this year and it was immediately immersed in hype and fanfare. THP received one and yours truly was extremely excited to see it arrive for my testing pleasure. Was the RAZR Fit a performer or a victim of its own hype? Check it out. Forged Composite- material in the crown that is lighter and stronger than titanium. The crown contains over 7 million turbostatic carbon fibers which allows Callaway’s engineers to control thickness which results in high MOI and an optimal center of gravity. Streamlined Surface Technology- aerodynamic contours reduce energy loss from drag during the downswing by 14% compared to its cousin, the RAZR Hawk, which creates higher impact speeds for added distance. Speed Frame Face Technology- combination of VFT and Hyperbolic Face Technology creates a large sweet spot and high ball speeds across the titanium face for long, consistent distance. The chemical milling process removes excess material for thickness control. The look of the RAZR Fit is that of a stealth bomber. It’s aggressive yet subtle look gives you the feeling that you’re playing with a pro’s kind of driver. At address it appears smaller than its 458cc size really is which appeals to me in that you’re not swinging the club and relying on its size to bail you out. Instead, it makes you think about hitting a golf shot and not hitting the ball. 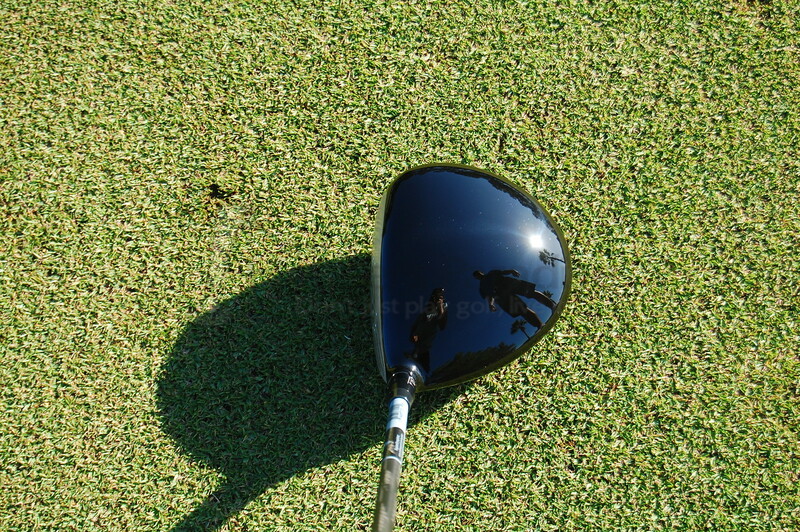 The all black crown with no alignment aid is elegantly lethal and just begs you to take a swing. I’m not normally one to get all worked up on what the sole of a golf club looks like because when do you see the club’s sole? In the bag? That’s fine but do you see it at address? Do you use it to hit the ball? I’d say no to both of these instances, however, this is the RAZR Fit which means that you may be spending as much time working with the sole of the club as any golf club you’ve ever had. Turn the club over and you’ll see the two weight ports that house a 12 gram and a 2 gram weight on either side of the sole. You’ll also notice that there’s a bit of aerodynamic design to the sole. It almost appears that the club just ‘falls off the back’ which sounds bad but it helps the biggest club in your bag glide through the air towards that unsuspecting golf ball sitting on the tee. The main color scheme of black and silver with red accents gives a look of cool class that you normally don’t mind in an era of ‘look at me’ drivers. 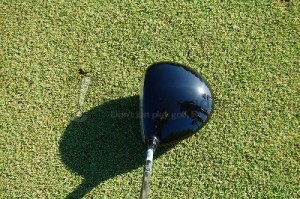 The ‘look at me’ factor that the RAZR Fit has is the performance of a golf shot. 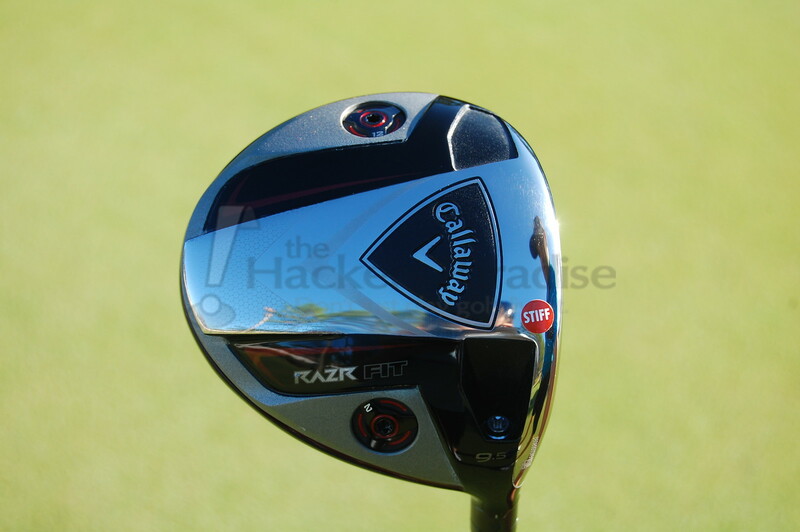 The Callaway RAZR Fit is an abundance of technology. So much so that one may think that you’re describing a car yet most of it is very simple to use and understand. Let’s look at the some of the technology that’s in this club. The OptiFit hosel is responsible for adjusting the face angle to an open, square, or closed position that you can distinctly see at address. This is designed to improve accuracy and trajectory of your golf shot. The second component of the OptiFit technology are the OptiFit weights (12 grams and 2 grams). These are meant to shift the clubhead’s center of gravity to promote either draw or neutral ball flights. Once a golfer achieves their optimal weight positioning and face angle the RAZR Fit’s potential can be fully unleashed. While this sounds daunting and somewhat intimidating, it’s a journey that may be very worthwhile for a golfer. The forged composite material (carbon fibers) in the crown is lighter and stronger than titanium. This technology is a carryover from last year’s line of drivers so this is not a ‘gimmick’ or a ‘fad’ in the eyes of Callaway’s engineers or designers. The crown contains over 7 million turbostatic carbon fibers which allows Callaway’s engineers to control thickness which results in high MOI and an optimal center of gravity. What this means for the club is that any weight saved from using the lighter materials is now being put to better use in other places in the club like the bottom and sides which helps with the overall MOI and placement of the center of gravity. Remember the look on the sole of the club that gave an appearance of ‘just falling off the back’ that I had mentioned before? The formal name for that look is Streamlined Surface Technology. That is aerodynamic contours which reduce energy loss from drag during the downswing. The weight that’s been removed from here is what creates higher club head speeds which in turn create impact speeds for added distance. It sounds great in theory and sounds and looks even better in practicality which you’ll read shortly. Last but not least is Speed Frame Face Technology. This creates a large sweet spot and high ball speeds across the titanium face for long, consistent distance. In addition to this, there’s also a chemical milling process that Callaway uses to remove any excess material from the clubface in order to achieve thickness control. By doing this, Callaway is taking away what you don’t need and giving you exactly what you do need. The rest is up to you. 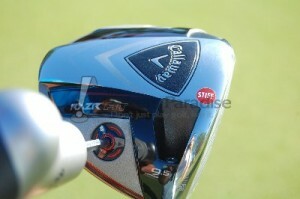 The RAZR Fit I received from Callaway for testing had a 9.5* loft and a stiff flex Aldila RIP’d shaft (60g). The first thing that I tested and played around with were the OptiFit settings. Changing the face angle and switching the weights around is easily done and takes less than 60 seconds to complete. On a side note, the wrench that Callaway provides to make these adjustments is really simple and easy to use. The way it fits in your hand really makes it easy to change the club around without too much effort at all which makes the adjustability of the club not only easy but actually fun. Simple adjustability that matters. You could spend hours trying to get dialed in with the RAZR Fit even though your setting options are somewhat limited. The ability to move the weights around AND adjust the face angle is what really has an impact to the golfer. I found that during my testing the setting of neutral face with the 12 gram weight in the heel was the configuration that worked best for me. The ball flight that I was getting was mid-high that was more on the higher side but by no means ballooning. I’m not a big mover or worker of the ball (well, except maybe to the right) but by setting the RAZR Fit up this way I seemed to have a straighter ball flight or on occasion a little draw which I’ve never had in my golfing life. The ball still seemed to have some roll out as well despite the higher side trajectory. The ball didn’t seem to want to hang on the face long at all and wanted to get up and going as soon as possible. So is the face really hot? Not extremely hot but hot enough to minimize distance loss where my most consistent miss is and that’s out on the toe. Sure it doesn’t go as far as when it’s hit on the screws but you’re also not being completely punished either. I did notice some shaft twisting but only on extreme misses out on the toe. I think the combination of the hot face as well as where and how the weight is distributed in the clubhead makes for a great combination. You know what else is hot about this driver? The sound it makes. 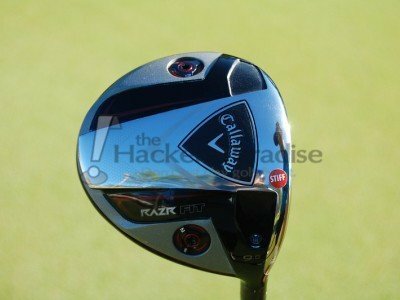 Callaway drivers have always had a muted sound to them but the RAZR Fit takes that muted sound to a whole different level. The sound still has the muted properties to it yet there’s a distinct ‘ting’ to it that doesn’t give it a wishy washy sound. It’s a powerful, audible sound that lets you know that you’ve caught it flush and at that point it’s time to watch the ball take off and disappear into the distance. The Callaway RAZR Fit is arguably the complete package. Looks, performance, sound, technology, what’s not to love? Callaway spent an awful lot of time researching and perfecting this driver and the finished product is really something that you need to swing and hear for yourself. The RAZR Fit will retail for $399 and due to the overwhelming response from Phil Mickelson’s win with the RAZR Fit this past weekend at Pebble beach, this driver is available in stores now. There’s a lot of buzz and hype surrounding this club however the performance lives up to it. If you don’t have the RAZR Fit on your short list to hit for 2012 then do yourself a favor and go hit it. You may even discover that performance over paint really isn’t just hype or a catchy marketing phrase. I changed from the Ping K15 to the Razr Fit. I gained 20+ yards and much, much straighter. I don’t hit it very long to begin with but the change to 220 and straight down the pipe is fabulous. By far the best driver I have ever hit. Tried out the Titleist 910 D12, the R11s and the RAZR Fit at my local range yesterday. Hands down, the Calloway was the best of the three. I’m an average golfer yet with the Calloway in my hands I was consistently hittin long straight drives all the way to the back of the range. This is an awesome club. Really can’t recommend it enough! Really love this club, Iam a terrible slicer and was hoping this would help me reduce my slice. I know, its not the club, its me. When I do hit it straight, it does go further than the callaway razr hawk I just sold. This club feels fantastic in your hands and easy to adjust. Iam currently looking into some private lessons as Ive had enough of the slice and lost balls on a links course. 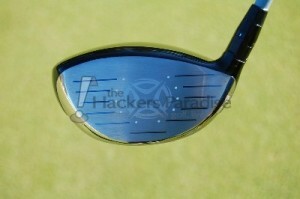 I tested the Titleist 913, Ping G25, R11, R9, Nike Covert, Callaway Extreme Fit, and Razr Fit. 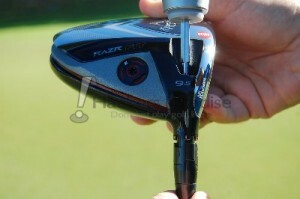 The other drivers had custom, expensive shafts and the Razr Fit had the stock GD 55 gram stiff shaft. I hit the Razr Fit 15-30 yards longer then the other drivers. The Ping G25 was 2nd in distance/accuracy. I was so impressed with the Razr Fit, I purchased a new driver and can’t wait to try it out on the course.